Loren Ellis artist and Founder of Art for Healing NYC Int;l Org. 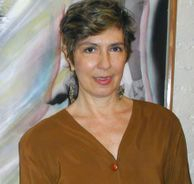 Loren founded Art for Healing NYC Int'l charity in May 2000 in Hell's Kitchen-Manhattan, to help the community have more access to the arts on a more personal meet the artist style. It has been proven involvement in the arts, whether you go to a museum, listen to music, dance, or draw, involvement in the arts is healing. We offer involvement in the arts via arts workshops, our 911 NYC arts book multimedia events, and via performances and exhibitions. I founded AfH as a sort of umbrella to protect and assist visual and performance artists to share their talent on a one to one with those who show interest. Growing up in Florida, with an appreciation of the visual and performing arts, Loren received a B.A. from U. of South Florida, and continued her studies at Florida State University where she completed a Masters in Fine Arts. 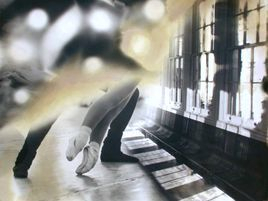 During her time at USF she studied modern ballet and violin for fun; though she always knew she is first a visual artist. 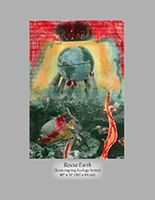 At FSU she concentrated on publishing her book and developed a unique mixed media photographic painting mural style which was her thesis. Loren has taught photography and photomontage at Columbia Grammar & Preparatory School, Parsons The New School for Design, Fashion Institute of Technology University of South Florida, and ongoing now ongoing with other artists, at Art for Healing NYC Int'l Gallery and at Your location in NYC area ! She has completed commissions from space and aeronautics to medical companies, including Johnson & Johnson, New York Yankees and portraits of mother and child etc. Commissioned work makes her stretch her imagination in directions she would not normally go. Loren calls her photographic paintings “a visual symphony” because each image is interesting in itself, yet it is the whole that makes the message. Each piece is hand printed and hand painted. All works are one of a kind and there is no computer use. Visit www.LorenEllisArt.com to read and see more about Loren and her art! 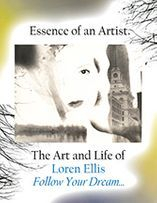 "The Essence of an Artist: The Art and Life of Loren Ellis..Follow Your Dream..."
Book and documentary in progress!!! Visit Loren's website to see the trailer. Newspaper Photo: Loren, far right received First Place for her drawing in 5th Grade for a Safety Poster ( of bicycles) competition! Book and Documentary in Process!! about Loren's life and art and founder of Art for Healing NYC Int'l org. 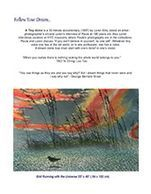 "Bird Running with the Universe"
Published at FSU Graduate School. 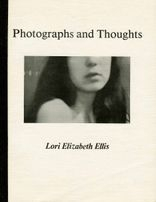 Loren's poetry and photographs, purchased by the MoMA and the NY Public Library Museum NYC.